Brainstorming is a creativity technique in which ideas are generated in order to solve a problem. The main result of a brainstorm session is a solution to a problem. The solution can be an idea which is a complete solution to the problem. It can be a list of ideas, leading to an approach to a subsequent solution of the problem. Or it can be a list of ideas resulting into a plan to find the final answer. Brainstorming was originated by Alex Osborn. 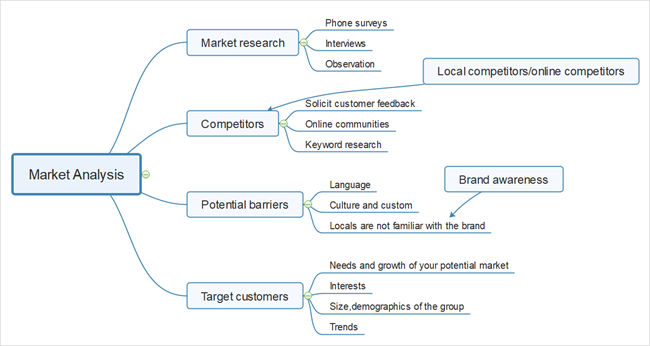 A good brainstorming diagram is an excellent tool to help your team arrive at the best ideas and plans. Brainstorming diagrams help you develop any system of related ideas or information by showing interrelationships among topics in a hierarchy. They improve clear associative thinking and communication, which encourages creativity and problem solving. 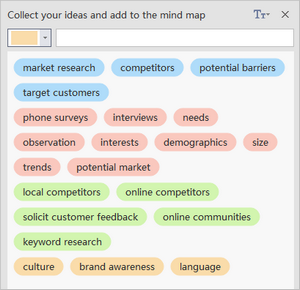 MindMaster is a quick and easy mind mapping software for creating great-looking mind maps (graphical representations of thought processes) for brainstorming, problems solving, rational analysis, tasks managing, notes taking and decision marking. Like the traditional brainstorming, you can record your ideas one by one on this collection board. The font size and the width of the collection board are alterable. You can hide the collection board when you don't need it. Ideas can be marked as different color. You can delete ideas in batches of the same color. Color pencil, rectangle, ellipse are available for you to use. The laser pen can be used as the moving cursor. 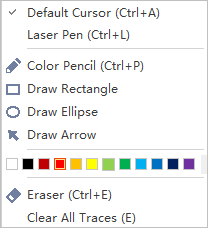 You can clear the marks with the eraser. You can set a time for the brainstorming. You can hide the timer form the canvas. 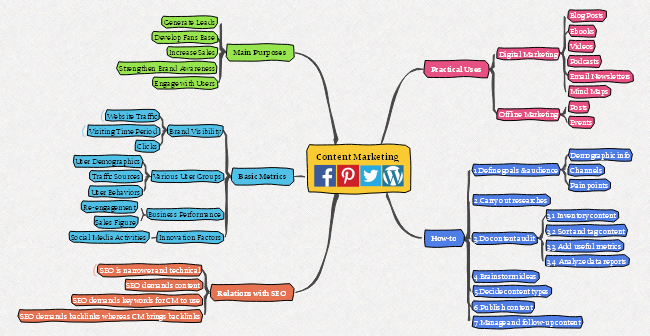 How to Proceed a Brainstorming With MindMaster? Open MindMaster and start "Brainstorming" function. 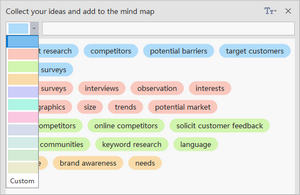 Brainstorming is a full-screen mode, the ideas board opens automatically on the left side. Write down the topic on the canvas and start timing. 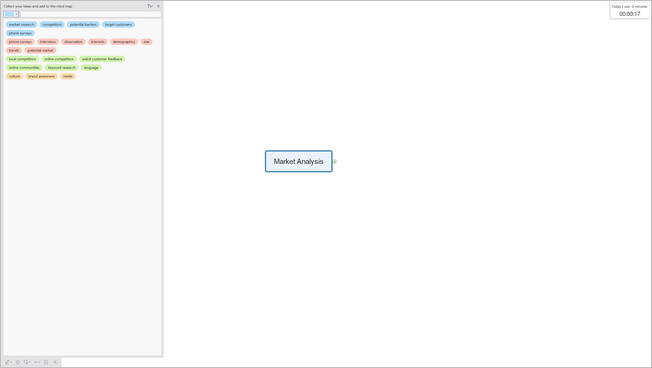 We take "how to do a market analysis" for example. The host announces the begin of brainstorming and everyone expresses themselves freely within a limited time. During this time host records everyone's ideas on the left side ideas collection zone. Also, if necessary, the host can mark ideas with different colors vary from participants. Combine the related ideas together and delete some repeating and impossible options. 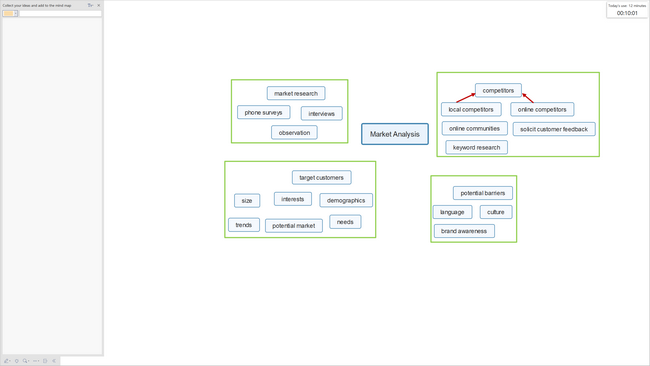 Analyze and discuss the ideas and then to divide them into different groups. To learn more about How to Run a Brainstorming Session: A Step-by-Step Guide. 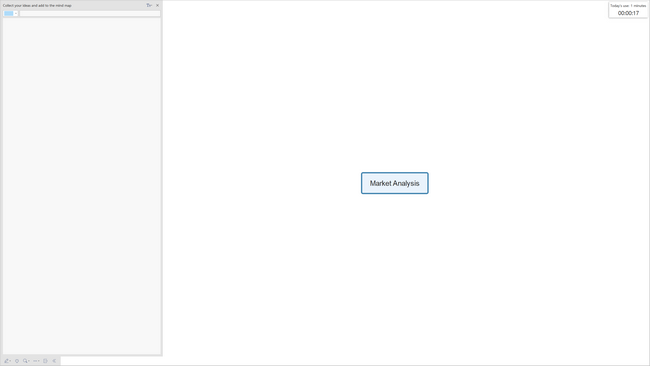 The following are some examples created by Edraw MindMaster. Business planning - develop and improve product ideas. Individual ideation: by means of generating a maximum number of potentially usable ideas in a minimum of time. A business conference: stimulate creative thinking in a judicial and relatively unproductive atmosphere. Creative training: brainstorming improves the creative attitude towards solving problems and improves the creative ability in groups and individual. Improve initiative: During a brainstorm session, participants are encouraged to constantly throwing their ideas, to take initiative all the time. This initiative can last even after the session. Improve creative thinking: Participants are encouraged to look from a creative perspective to the problem and the power of association is used to create ideas. Improve morale: The participants work together as a team to find a solution to a problem and every participant is encouraged to take initiative. These two factors can improve the morale of the team and its members. Have more FUN: Most of the participants like the interactive and creative atmosphere in which problems are solved and creativity is enhanced. All these uses are supported by Edraw MindMaster, making it the ideal productivity software for your brainstorming and creative, radiant thinking needs. 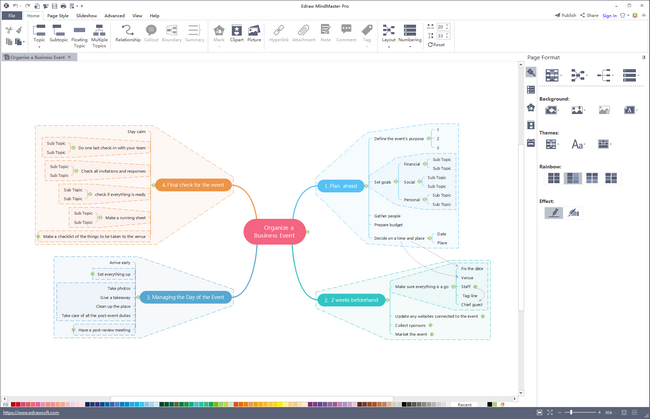 Edraw MindMaster - The Best Free Mind Map Software for All Platforms!